In view of the ongoing refugee crisis in France, the timing for the United States debut of a film like Philippe Faucon’s Fatima could not have been better. For those unfamiliar with the last half-century of French history, the Algerian crisis of the late 1950s, brought on by that country’s war of independence, incited a coup d’état that made General Charles de Gaulle president of France. When a treaty ended the war in 1962, there was a mass exodus of European-Algerians along with thousands of Algerian Muslims who had sided with the local French government. A bloody civil war that raged during the early 1990s led more Algerian Muslims like the title character of this film to emigrate to France. 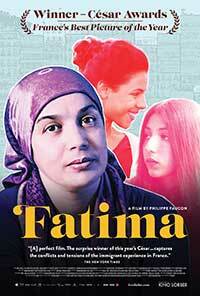 Fatima (Soria Zéroual), is a divorced Muslim woman working at menial jobs like cleaning house to support her two daughters, 18-year old medical student Nesrine (Zita Hanrot) and 15-year old high-school student Souad (Kenza-Noah Aïche). Fatima struggles to make ends meet and her very limited French language skills impede her progress in society and acceptance by her new fellow countrymen. She finds it impossible to communicate with the rebellious Souad who cuts classes and refuses to study. Nesrine, however, is working herself into a frazzle just to keep pace with her demanding medical studies. The daughters’ father (Chawki Amari) occasionally enters their lives during their moments of crisis but is otherwise not very involved. When Fatima is injured in a fall, she experiences dark personal moments calling nto question everything that she has believed and has tried to accomplish as a single parent, a Muslim woman who wears a hijab (headscarf), and a foreigner in a xenophobic country. Fatima has an epiphany when she decides to be more upfront with her daughters. She begins to express her feelings by writing a personal journal in Arabic, the only language in which she feels that she can comfortably communicate with her children. Faucon’s decision to use a non-professional actress for the title role turns out to be stroke of genius, as Zéroual brings an authenticity to her part that transcends mere acting. We genuinely feel the pain of her struggle to speak a language that has nuances well beyond her understanding. The two supporting actresses create very credible young women who, unlike their mother, have adopted the culture and language of their new country. Fatima is a small-scale and very intimate story of a quietly strong woman and has already won several César Awards (Best Film, Best Adapted Screenplay and Most Promising Actress (Zita Hanrot)). As an official selection of the 2015 Director’s Fortnight at Cannes, Fatima will open at the Film Society of Lincoln Center in New York City on August 26, 2016 and then in Los Angeles on September 16, 2016. Fatima is a small film that makes a huge statement about the power of the human spirit that surmounts the difficulties of immigrant life in a foreign country.